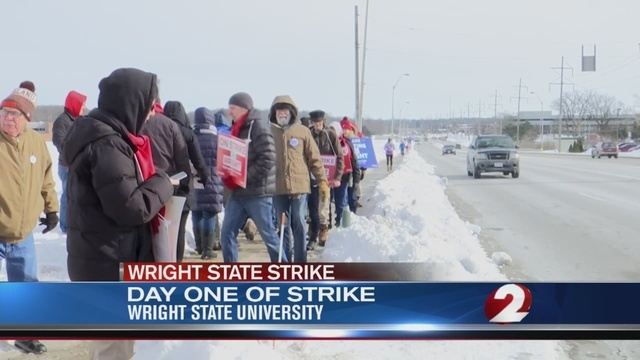 After failing to reach an agreement with their administration over newly imposed working conditions, including a furlough policy, the Wright State University faculty union started a threatened strike Tuesday. Wearing the union-advised dress code of “layers, layers, layers,” dozens of professors faced winter morning weather to picket starting at 8 a.m. Their ranks grew over the course of the day. Many students came to show support. Many others attended classes as usual. The university said in a statement that 40 percent of American Association of University Professors-affiliated faculty members at its main Dayton, Ohio, campus were teaching their classes or planned to. Some 53 percent of AAUP-represented professors were teaching or would be teaching at the Lake campus, it said. previous post: What did the LA Teachers Strike to Achieve? next post: End the Government Shutdown: Call Your Senator Now!